All of Mercury Research's report products are updated on a quarterly basis. See here for the current report schedule. 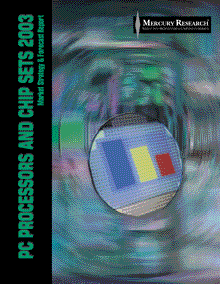 The PC Processor report provides quantitative statistics on the PC microprocessor industry. Within the report are quarterly shipment, pricing and revenue estimates by product for Intel, AMD, and VIA processors forecast for two years into the future, with the overall market forecast out five years. Also within the report is quarterly market share by major CPU segment (desktop, notebook, and server). The product is delivered as a written PDF report and as an Excel-compatible spreadsheet, which includes both the major data tables from the PDF report and a pivot table compatible database of the quarterly history and forecast period covered by the report. 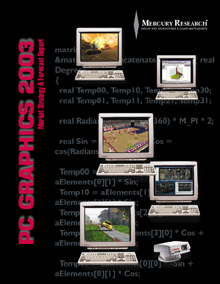 This report contains detailed graphics market and vendor information, including market forecasts for both desktop, mobile and integrated graphics components, average selling prices, memory usage, relative product performance and cost comparisons, and comprehensive market share coverage by product type. AMD, Intel, and Nvidia are all covered in the report. Each of Mercury Research's reports are updated quarterly and are sold with either a 5-user annual site license for $9,495 or a 50-user annual license for $9,995. The reports are delivered as files emailed to a customer-supplied subscriber list. Mercury Research's products are used primarily by PC OEMs, semiconductor suppliers, and companies with key interests in the PC manufacturing pipeline such as silicon foundries and equipment suppliers. Anyone having responsibility for forecasting market growth, assessing the competitive environment of suppliers in the processor or graphics/GPU markets or performing product planning for PC related components will likely find our research useful.